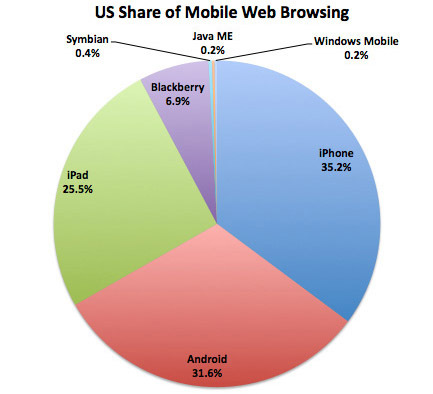 The iPad now accounts for 1% of total global web browsing according to new figures from Net Applications NetMarketshare. The report also says that the iPad accounts for 2.1% of the total U.S. browsing traffic. Those are some impressive figures to attribute to just a single device, but they underscore the fact that mobile browsing in general has been seeing steady rises. Indeed mobile devices now account for 5% of global web browsing (meaning that the iPad accounts for 20% of global mobile web browsing!). iOS devices in total i..e iPads, iPhones and iPod Touches account for a very healthy two thirds of all mobile browsing in the U.S. That leaves Android in second place with 31.6% and BlackBerry brings up the rear with 7%. The other platforms don't really register in the U.S. although with Windows Mobile coming up steadily and Android expanding at a breakneck pace these figures will no doubt change.